What makes the perfect castle? Battlements? Tick! Turrets? Tick! Moat? Tick! Starborough Castle has it all. There’s a cosy great hall, with a minstrel’s gallery (aka the kitchen) above and two oak-panelled bedrooms with a bathroom below. It might be small, but it’s perfectly formed. Midway between Edenbridge and Lingfield and right on the border of Kent and Surrey, this little piece of England encompasses 10 acres. The days of knights might be long past, but with a little imagination you can easily play at courtly romance here, swashing your fantasy buckles around the ramparts. It’s a Gothic folly (Grade 2* Listed) built by Sir James Burrow in 1754. But it is built on the site of an ancient castle or, at the very least, a medieval fortified manor house, dating from 1342. And it makes use of the dressed sandstone of that building, which was torn down by Oliver Cromwell’s forces in 1649 to prevent it falling into the hands of the Royalists. At the end of the 19th century, this fairytale pavilion itself fell into disrepair. Finally, a local farmer spent nearly 20 years restoring it before selling it to London gallery owner, Warwick Leadlay, in 1989. Leadlay came up with some creative ways to add living space. Maybe he was thinking of Tennyson’s Lady of Shalott: “Outside the isle a shallow boat, beneath a willow lay afloat”. In this case, it’s more of a longboat on the moat, moored to provide another bedroom. A bedroom in which the dappled sunlight playing on the water glitters and glistens on the walls and ceiling. A separate cottage with a bedroom and open-plan living area lies on the other side of your personal, stone-built bridge. As well as a detached garage, there’s an open barn with parking for two more cars. There’s also stabling, a one acre paddock, a seven-acre field and a longboat. Leadlay, a colourful figure, held an annual jazz festival in the grounds, as well as hosting wedding receptions. He sold the property in 2003 and now it’s on the market for the first time in 13 years. 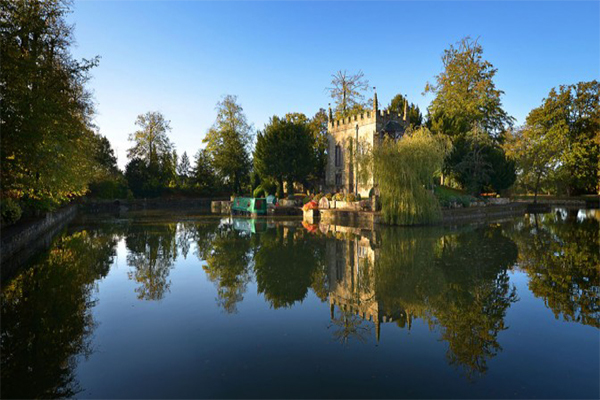 For the princely sum of £1.75m, you could enjoy this magical waterside home. Although it feels wonderfully remote, London trains take less than an hour from both Edenbridge and Lingfield, while junction 6 of the M25 is less than 20 minutes away by car. Even King Arthur would be hard pushed to find a more congenial spot.